Global Strategy Forum and the Geneva Initiative co-hosted a seminar on the Middle East Peace Process, attended by a delegation of Israelis and Palestinians. The seminar in the House of Lords was opened by Foreign Office Minister Alistair Burt MP. 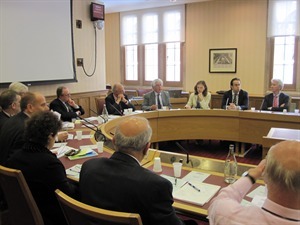 On 23rd May 2011, Global Strategy Forum in co-operation with the Geneva Initiative held a seminar entitled “Looking to September: What Role Can The International Community Play In The Middle East Peace Process?” in Committee Room 4A of the House of Lords. The Chairman was Lord Lothian, Chairman of GSF. The speakers were: Gadi Baltiansky, Director-General, HL Education for Peace – The Geneva Initiative (Tel Aviv); Alistair Burt MP,Parliamentary Under Secretary of State at the Foreign & Commonwealth Office; Nidal Foqaha, Director-General, The Palestinian Peace Coalition – The Geneva Initiative (Ramallah);Lord Hannay of Chiswick, GCMG, CH;Ambassador and UK Permanent Representative to the UN (1990-1995) and Special Representative for Cyprus (1996-2003); Sophie Honey, Head, Near East Group, Middle East and North Africa Directorate, Foreign and Commonwealth Office; Dr. Nazmi Jubeh,Member of the Geneva Initiative and expert in Jerusalem affairs; Lord Lothian PC, QC, DL,Chairman, Global Strategy Forum; Israela Oron,Retired Brigadier General in the IDF, former Deputy National Security Advisor and member of the Geneva Initiative; Professor Avi Shlaim, FBA,Professor of International Relations, University of Oxford. The seminar was followed by a lunch for speakers and guests. The Rt Hon James Arbuthnot MP was our guest of honour and his speech was followed by a reply from the Palestinian Ambassador, HE Professor Manuel S Hassassian. The Seminar Programme can be downloaded here.